For part 38 of my youtube countdown, I have another fantastic George Harrison duet. This time its with Paul. No not McCartney, but SIMON! This version of George and Paul tackle George’s incomprehensible 1969 stunner, “Here Comes the Sun.” The occasion was Saturday Night Live and the results were breathtaking. 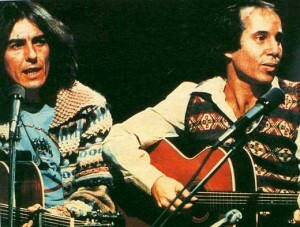 George hits all his acoustic marks with perfection, and Paul Simon’s voice just melts perfectly into George’s harmony. The freaky thing about the video is how Paul Simon keeps looking at George like he wants to take him to bed, or more likely, create a new group called “Simon and Harrison.” But George wasn’t about to be stuck with another Paul telling him what type of guitar solo to play on “Still Crazy After All These Years.” So, instead, like with most of rock and roll history, we just have singular moments, and here’s a good one, enjoy. Powered by WordPress v 5.0. Page in 0.474 seconds.